Monaco real estate had its best year on record in 2014 as a weak euro lured international buyers. Rich Russians poured money into Monaco real estate last year, confirming the tiny city state's reputation as one of the world's most sought after addresses. Residential real estate in the European principality -- where nearly one in every three people is a millionaire -- had its best year on record in 2014. Property consultancy Savills said total real estate sales hit €2.4 billion ($2.7 billion) last year, beating the previous peak in 2007. The weaker euro helped lure investors by making Monaco more affordable to buyers paying in U.S. dollars, British pounds or Swiss francs. Some of the cash flowing out of Russia also found its way to Monaco. Russian buyers were particularly active last year, Savills said in a report. Those paying U.S. dollars saved around 20% on plush pads thanks to the sagging euro. A two-million euro Monaco property now costs $2.2 million, down from $2.8 million a year ago. Monaco ranks behind Hong Kong as the priciest real estate in the world. Prime property goes for $10,700 per square foot in Hong Kong; $9,000 in Monaco; and $6,100 in New York. Monaco is a magnet for the world's richest people. At just 6% the size of Manhattan, the city state boasts the highest concentration of ultra wealthy individuals, enticed by its zero rate of income tax and global appeal. The Mediterranean city is a playground for the rich and famous, studded with super yachts and other signs of luxury living. Savills say the super rich usually pair a home in Monaco with another in London, New York or Moscow. The outlook for prices in the principality remains stable, Savills said, bucking the broader trend of cooling prime property markets in cities around the world. 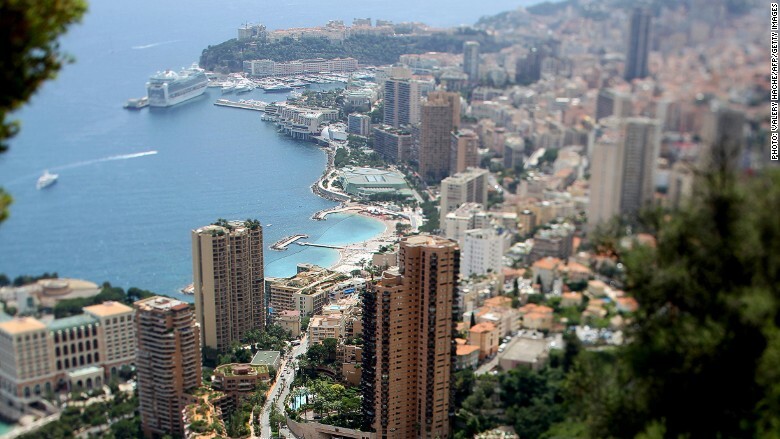 Extremely low land supply coupled with Monaco's cachet is expected to support the market. "Monaco's history and heritage is something that the competition in emerging enclaves just can't replicate," according to the report.